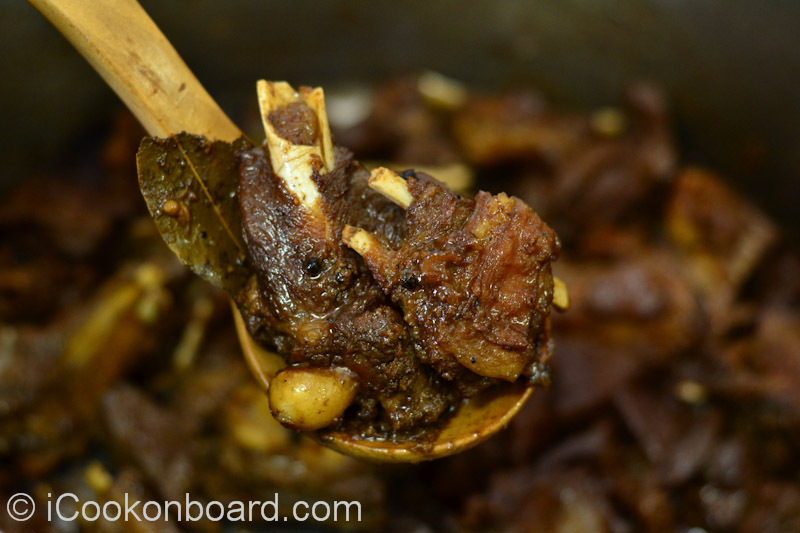 Goat meat Adobo is something you might wanna give a try, you’ll gonna love it! Some food is so good they leave a special mark in your memories. Some even make it a portal to go back in time and place where they eat a specific food. A co-blogger that I truly admire can go back in 1970’s Manila whenever she sip a hot soup of Beef Pochero. Just for the record, It has been more than 5 months since my last step on dry land. And I’m starting to talk to myself, thanks God I’m not replying to all my stupid questions. A very nice cabin will start to feel like a floating prison cell after 5 months. In the water world, everything will defend on your ability to create a way to make your time pass by as fast as possible. Today, please join me as I escape my cabin and use my “Adobong Kambing Portal” to go back in 2007’s Carribean Sea. I’m already having a nice smile on my face just by writing the word “Carribean Sea”. I find it hard to describe how scenic it is, how we enjoy the sweet summer sun and how we rock the night out of it! We use to bring live goat and pig onboard. Roast the whole pig on charcoal and make alot of PULUTAN out of a goat. 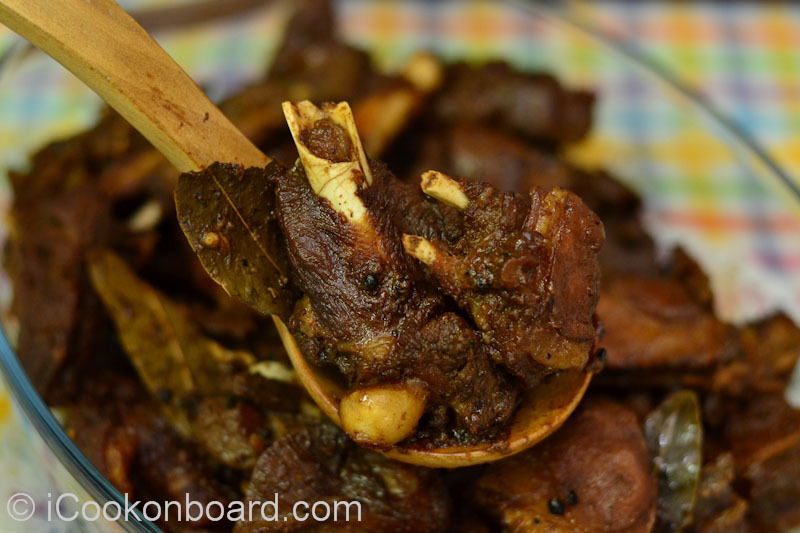 Adobo is one of my favorite goat dish. Our Master, Capt. 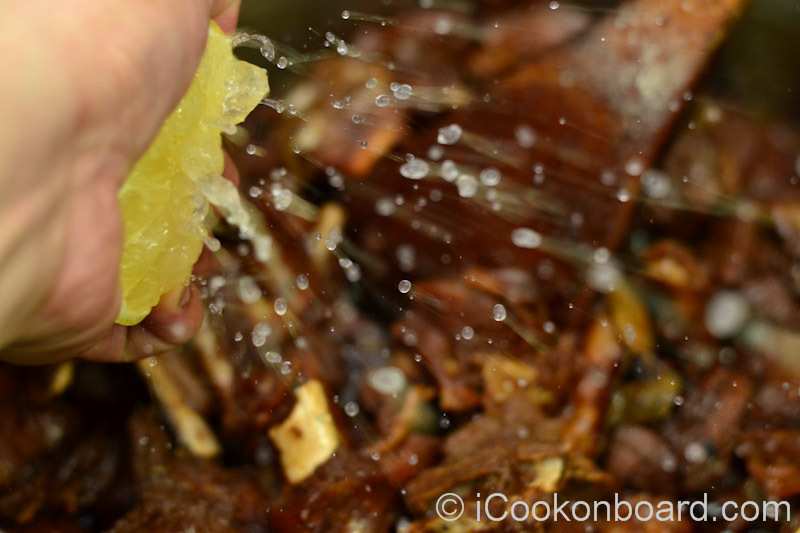 Dante suggested to squeeze a lemon at the last part of the Adobong Kambing procedure. It really made all the difference. Making the taste balanced and adding a citrus kick on the meat. If you haven’t tried it yet, I highly recommend you should give it a try! 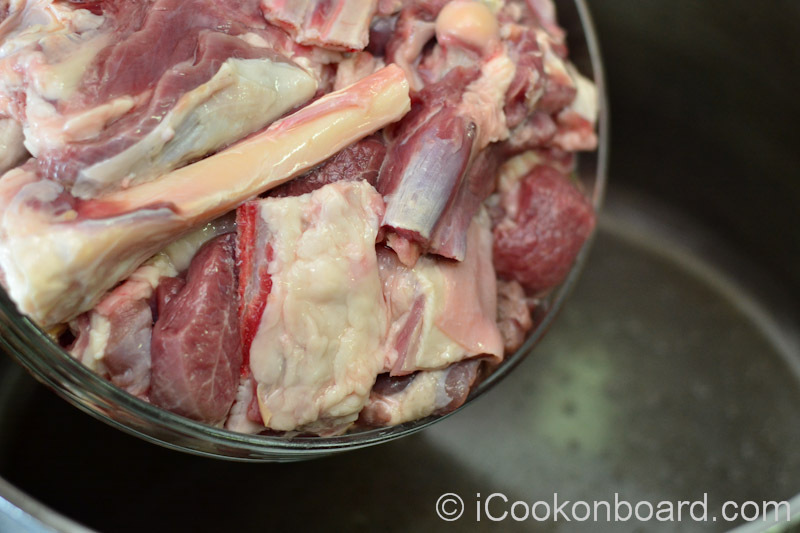 Place goat meat on a large pot with vegs. 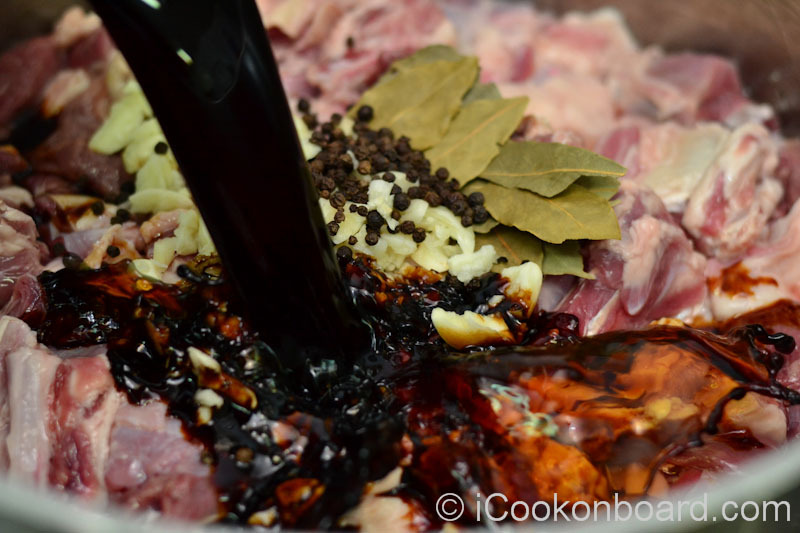 cooking oil, garlic, bayleaf and peppercorn. Pour Kikoman soy sauce, stir to evenly blend the flavour. Cover pot with lid and place on very high heat. Bring it to a boil, then lower heat to simmer. Pour in the vinegar. Bring heat to medium-high heat, cover with lid crack open for 5 minutes. Avoid stirring while the vinegar is being cooked. Squeeze in lemon/kalamansi juice, stir to blend flavour. 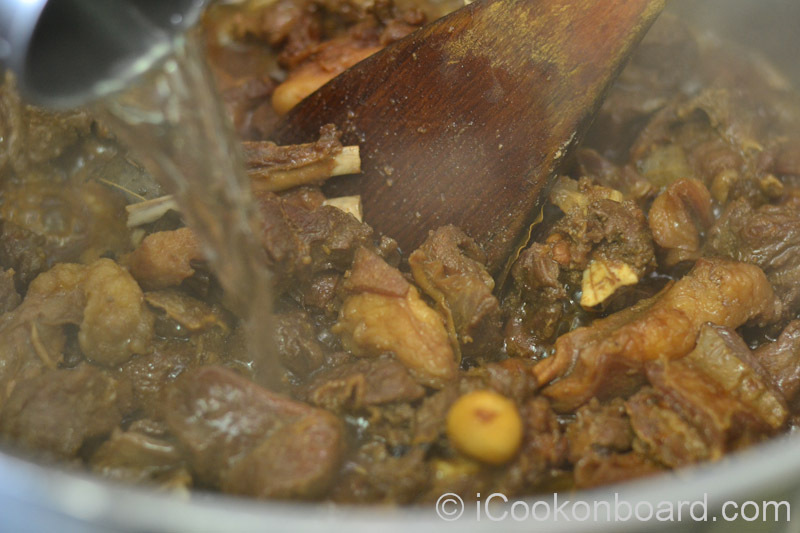 Since goat is full of fats, you can tilt the pot and scoop out the excess fat oil. Lastly add the sugar, season with salt and freshly ground black pepper to adjust to your desired taste. 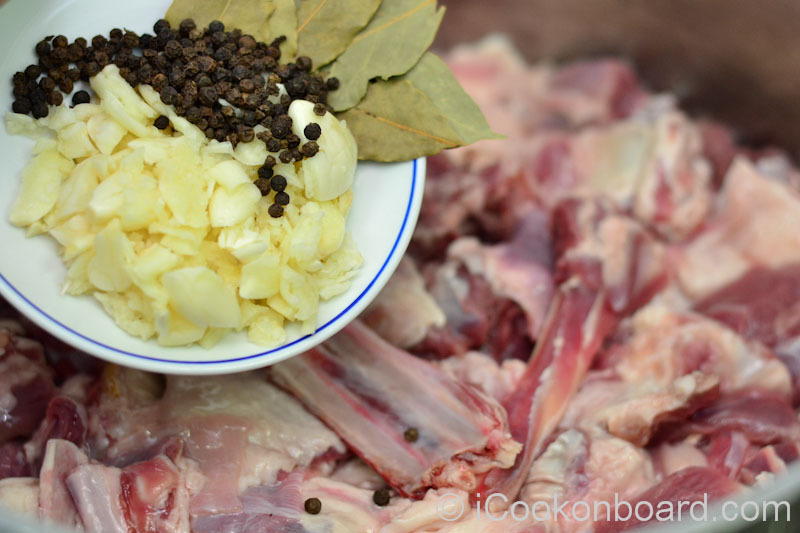 Add garlic, bayleaf and peppercorn to the pot of goat meat. Pour in Kikoman soy sauce. Cover pot with lid and place on very high heat. Bring it to a boil, then lower heat to simmer. 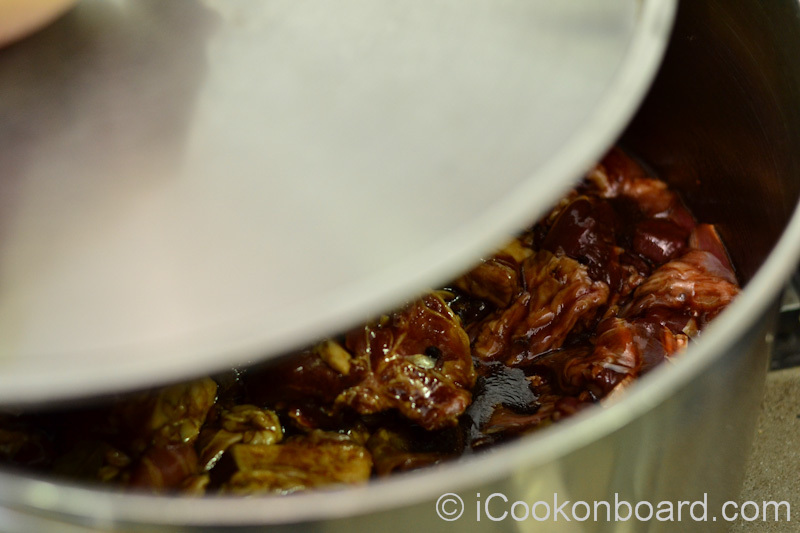 While simmering on low heat occationally check, stir and add water if sauce is drying up. Squeeze in lemon/kalamansi juice, stir to blend flavour. 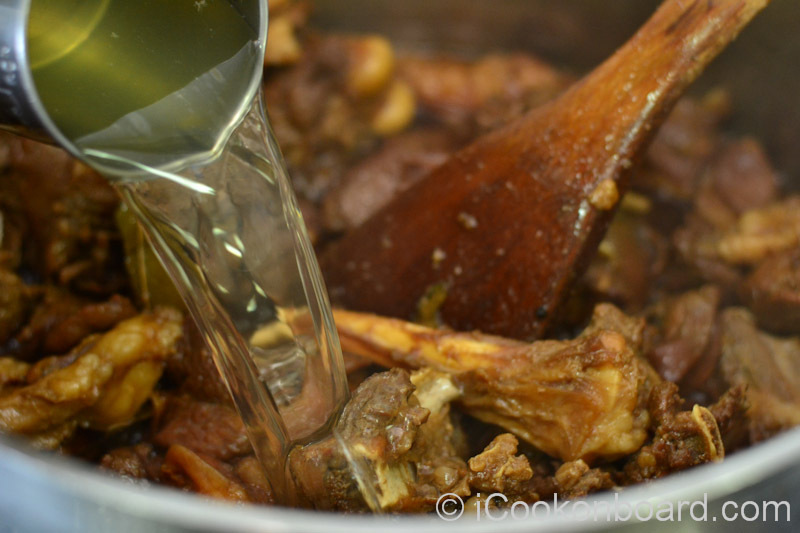 Since goat is full of fats, you can tilt the pot and scoop out the excess fat oil. 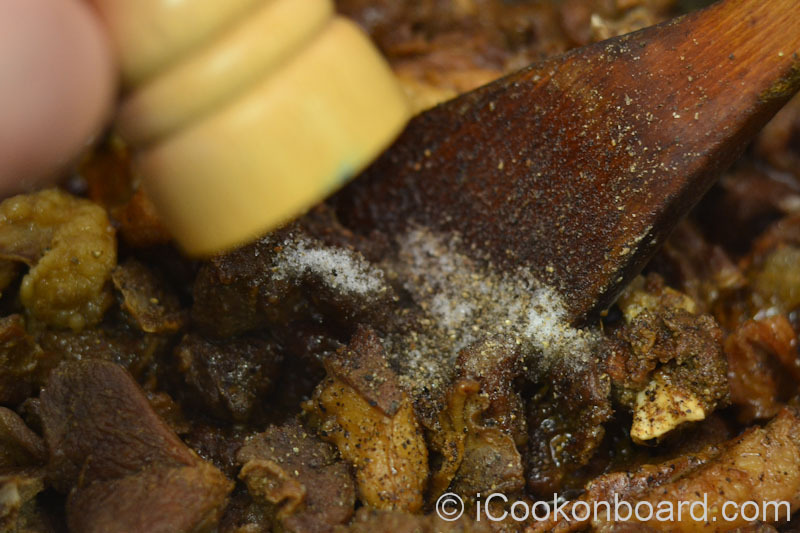 encourage youto try cooking some Goat meat Adobo! Come All You Party People!!! and Jess @Cooking Is My Sport. It’s so funny – goat shouldn’t be so boutique, but it is. At least we can now buy some if we really want to here. I love your blog by the way (we have a friend who is a ship’s cook), but i don’t think it’ll ever make me a ship’s cook. Come to think of it, shearers’ cook is more in my genetic makeup, and I’ve never done that either. Enjoy your freedom, such as it is. Very inspiring feedback! You’ve made my day!!! 5 months at sea, wow! And this goat adobo looks spectacular! Give it a try, you’ll probably enjoy it! Yumminess! Chicken and pork adobo is one of my comfort foods. I never even thought about goat. Come to think of it, I don’t know that I ever encounter goat on U.S. menus but it sounds super sarap, Nino! I also grew up with chicken and pork adobo as a main course with rice. 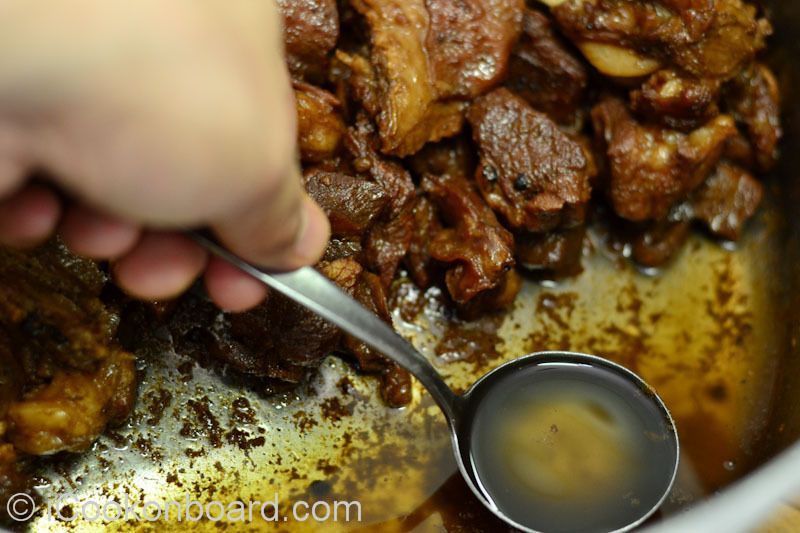 Only recently when I sailed with the Bicolanos, I was introduced with a lot of goat dishes. Thanks for visiting, Diahann! Goat interesting,not something that is readily available in our cities in South Africa,but big in the rural areas in the African culture.Cant believe it’s been so long since you have been on land,wow. Thanks for the info on Goat availability in your place. It’s been a long time since I ate goat and it’s a crying shame! I must head into the city ASAP and get some so I can try this out. Do you serve it with rice? Could even try with mutton/lamb if I can’t get hold of the goat. Thanks for sharing! FF is such a goldmine! Yes, we always have it with steamed rice. Mutton/lamb will do just the same. You’re right on FF being a gold mine! Happy Fiesta Friday! Thank you for visiting! I would never take that oil out. 😀 This dish sounds really perfect, Nino. The photos are gorgeous, too! Happy FF! I know someone will protest about the fat oil. I actually put a note on it saying that is optional. But I delete it knowing I can add it here on the comments if ever I was right on my prediction. And Yes, I was really right about! Lol. Happy FF too, Jhuls! Thank you very much for your honest feedback! Haha! I know it’s not healthy at all, but that’s fun. 😀 Have a pleasant weekend! Hi Nino- this dish looks so warm, hearty and comforting. I’ve never had goat meat before, but I’m sure I would love it cooked like this. Thanks for bringing this to FF! Thanks for co-hosting this week’s Fiesta Friday! I’m glad you stop by.